An audio power amplifier is an electronic amplifier that amplifies low-power audio signals (signals composed primarily of frequencies between 20 - 20 000 Hz) to a level suitable for driving loudspeakers. The preceding stages in such a chain are low power audio amplifiers which perform tasks like pre-amplification (this is particularly associated with record turntable signals), equalization, tone controls, mixing/effects, or audio sources like record players, CD players, and cassette players. Most audio power amplifiers require these low-level inputs to adhere to line levels. 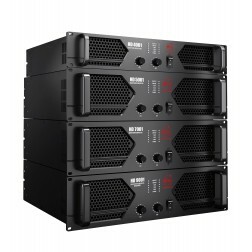 While the input signal to an audio power amplifier may measure only a few hundred microwatts, its output may be tens or hundreds of watts for a home system or thousands or tens of thousands of watts for a concert sound reinforcement system. Important applications include public address systems, theatrical and concert sound reinforcement systems, and domestic systems such as a stereo or home-theatre system. Instrument amplifiers including guitar amplifiers and electric keyboard amplifiers also use audio power amplifiers. In some cases, the power amplifier for an instrument is integrated into a single amplifier "head" which contains a preamplifier, tone controls, and electronic effects. In other cases, musicians may create a setup with separate rack mount preamplifiers, equalizers, and a power amplifier in a separate chassis.